Our heavy weight fleece is good looking, comfortable and rugged. When wet, ring it out and it will dry quickly. Very practical and compared to competition it is an excellent value. The zip-top is 100% polyester fleece material and is heavy weight, static free with convenient half-zip neck for venting. This is worth it's weight in gold on a cold, windy day. Stay warm! 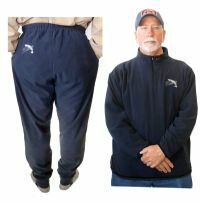 The bottoms are 100% polyester fleece material, heavy weight static free with draw cord, elastic waist band and 2 side pockets - 1 with zipper closure. The one super feature on the bottoms is stirrup. It keeps them from riding up the leg. You will love these. At this price you can buy two pair and always have a spare.